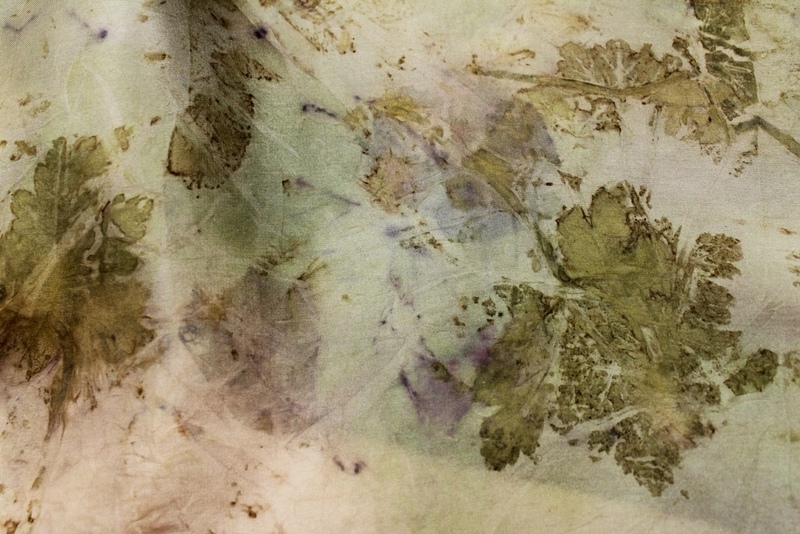 Detail pics of textiles eco dyed and printed this month and late last month. 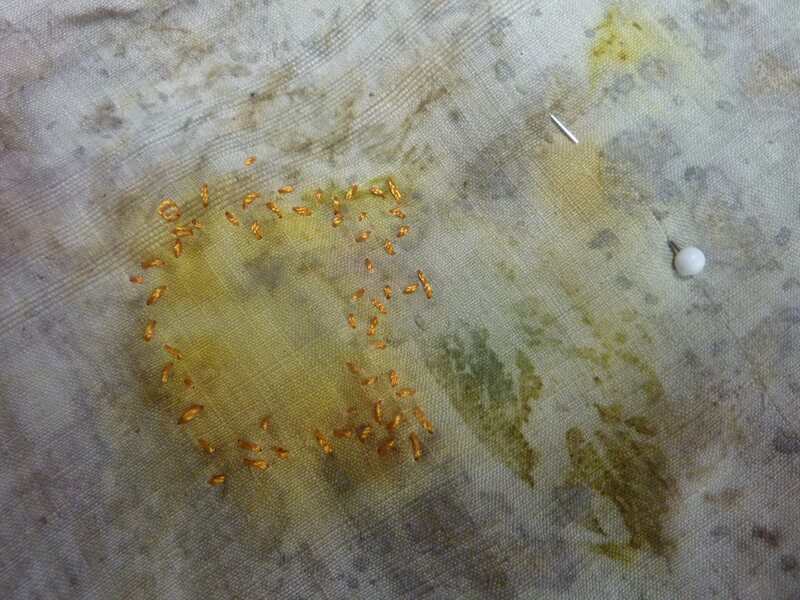 Dye stuffs from tagetes marigolds were plentiful so there are lots of yellows and oranges. Red cabbage, eucalyptus, red sumac berries, fresh bay leaves and golden rod offered interesting variations to marigold colours. 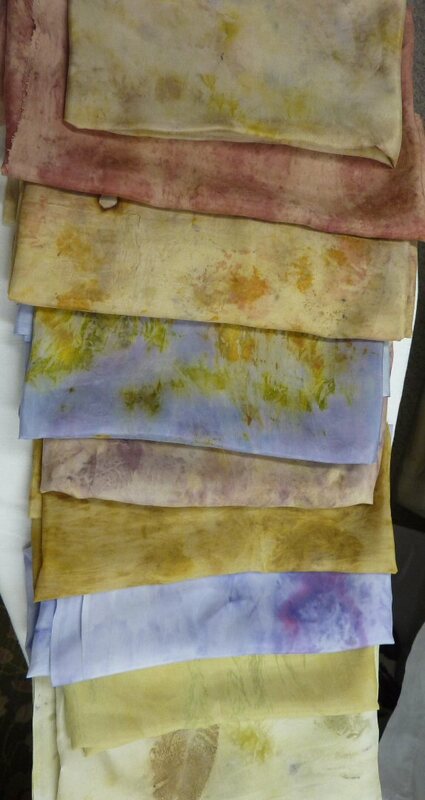 Note that eucalyptus gave a yellow overall (immersion) dye but pinks and reds as contact prints in an eco bundle. 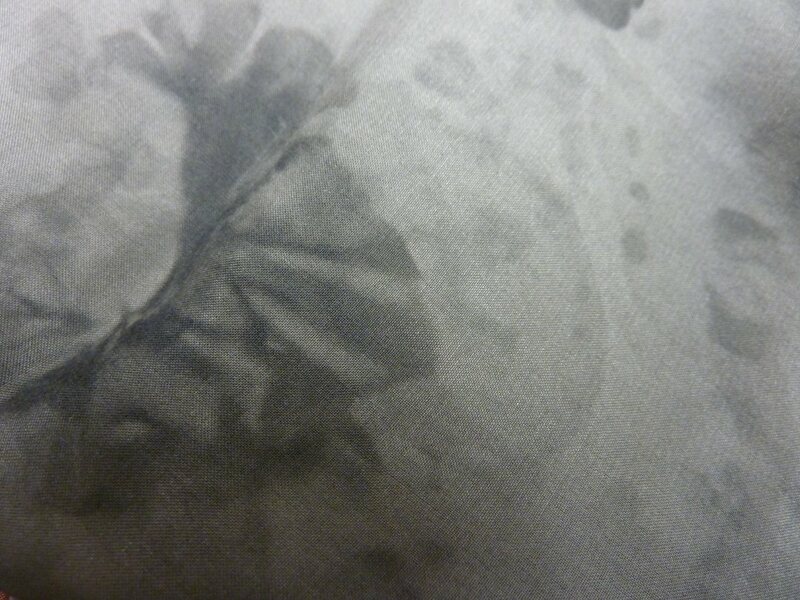 See Image # 4, below for the contact print. 1. 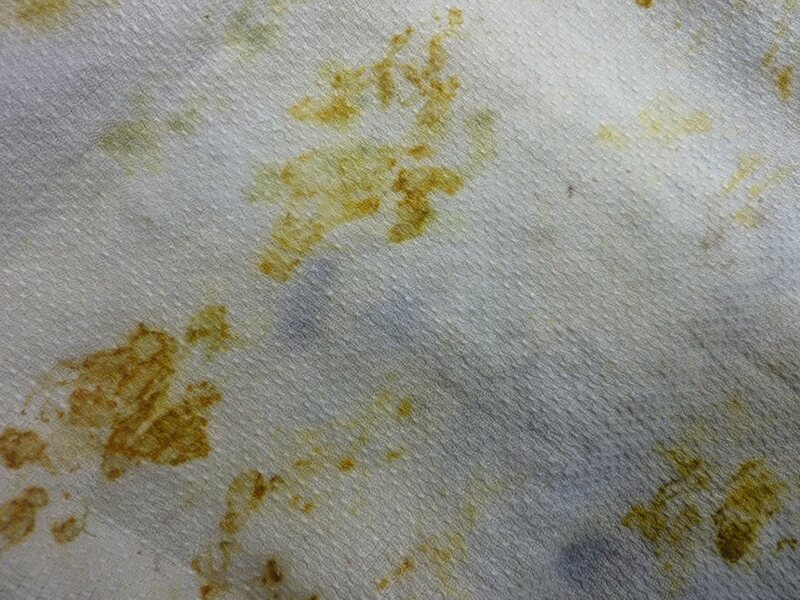 Orange-yellows from marigold petals, greens from the marigold calix and violet from red cabbage. 2. 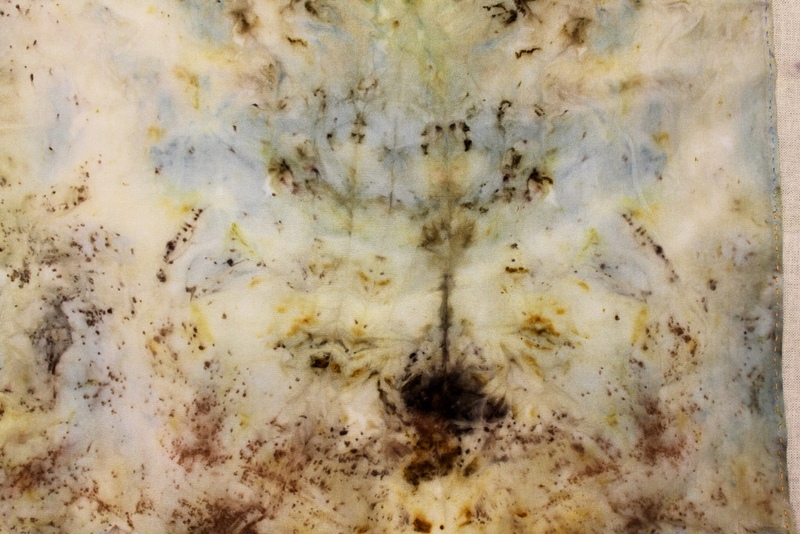 Mixed yellow bloom eco prints (anthemis, coreopsis, marigold) modified with iron liquor (rusty nails in vinegar) by splashing areas. 3. 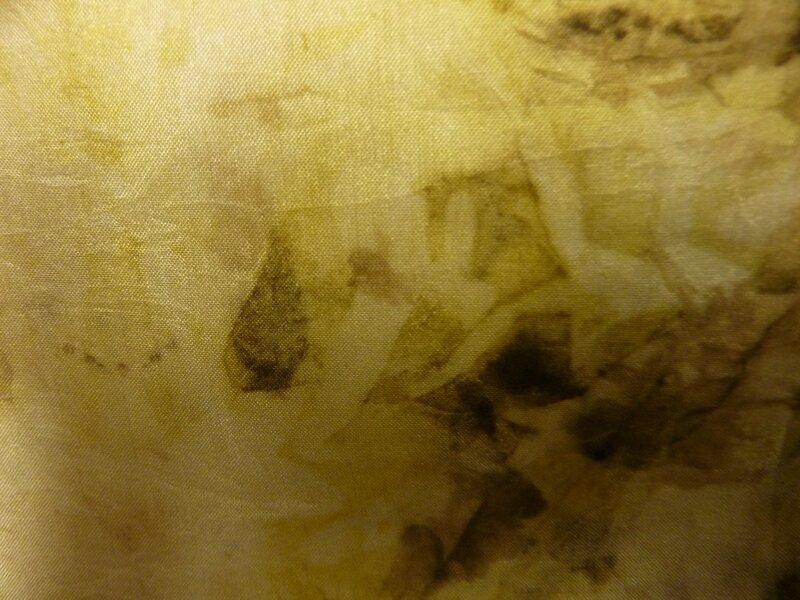 Detail: Coreopsis verticillata, dried and fresh, bundled in alum-mordanted silk habotai (8 mm) and steamed for an hour. 4. 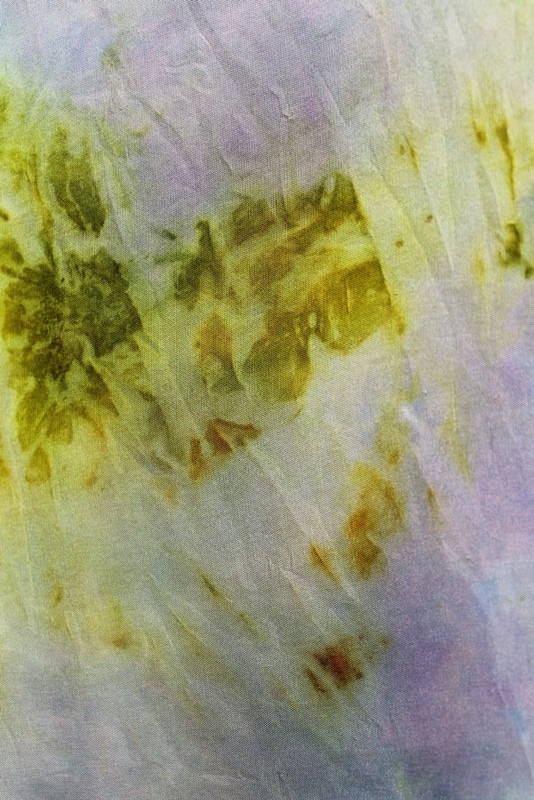 Detail: Eco bundles with eucalyptus (pinks), tagetes (oranges) , purple sandcherry (blues), purple basil (blues, purples) and fresh bay leaf eco print on silk. The burned area? 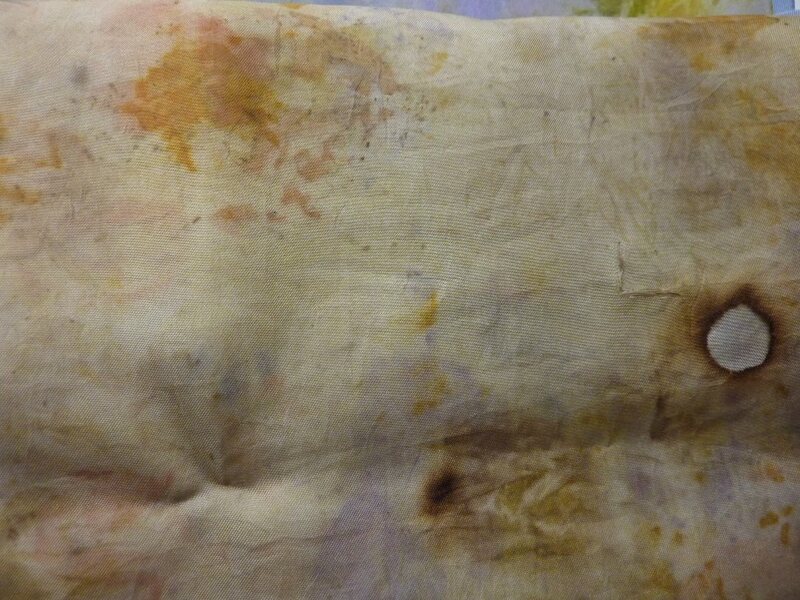 I cooked this bundle in the microwave but failed to wet the plants and the textile sufficiently…the bay leaves dried up fast (they are not very absorbant) and caught fire…NOT a recommended practice at 3 a.m. in the morning…But the series of burn marks all through the bundle looks great. 7. 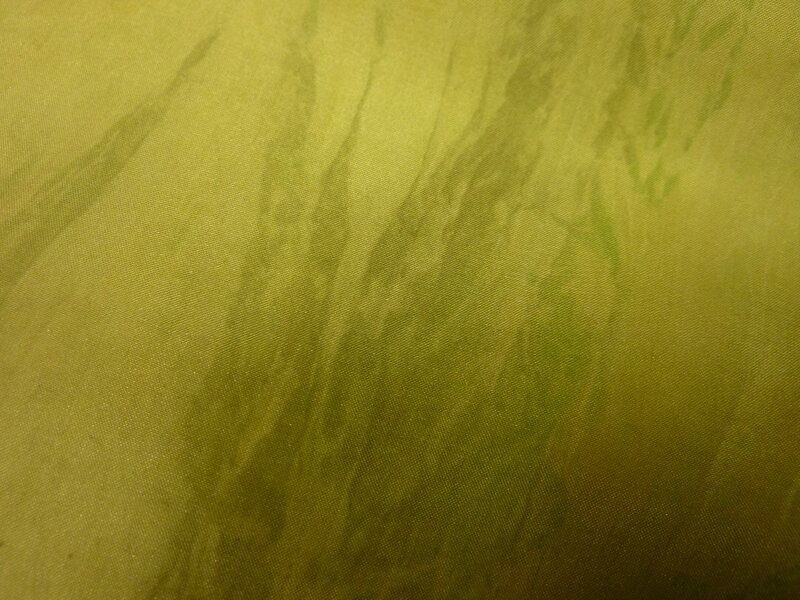 Detail: Golden Rod (whole plant) eco print on silk: greens from the leaves; yellows from the blooms. 8. Detail: Eco bundled tagetes marigold (orange from petals and green from calix) and coreopsis verticillata (red-orange) on silk . 9. 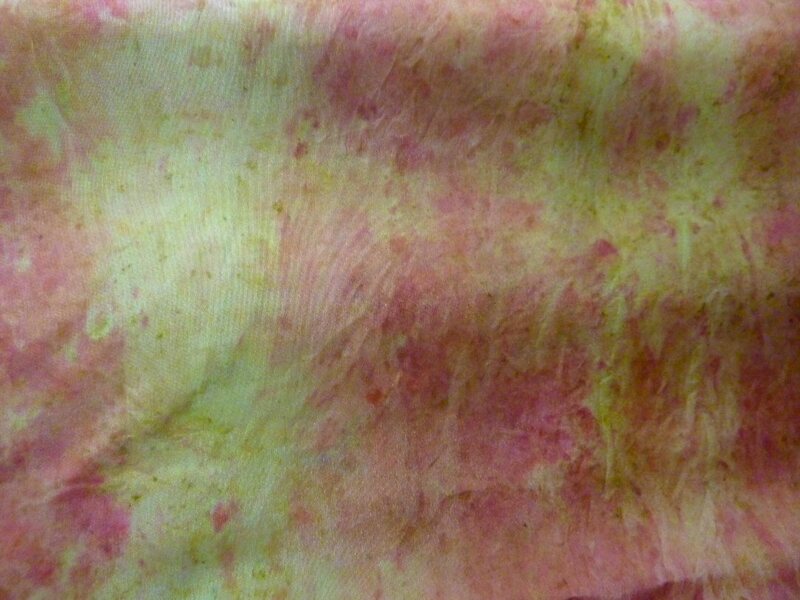 Detail: Silk, first dyed all over (immersion dye bath) with tagetes mari for a lighter yellow; then eco bundled and steamed with marigold blossoms to give darker orange areas. 10. 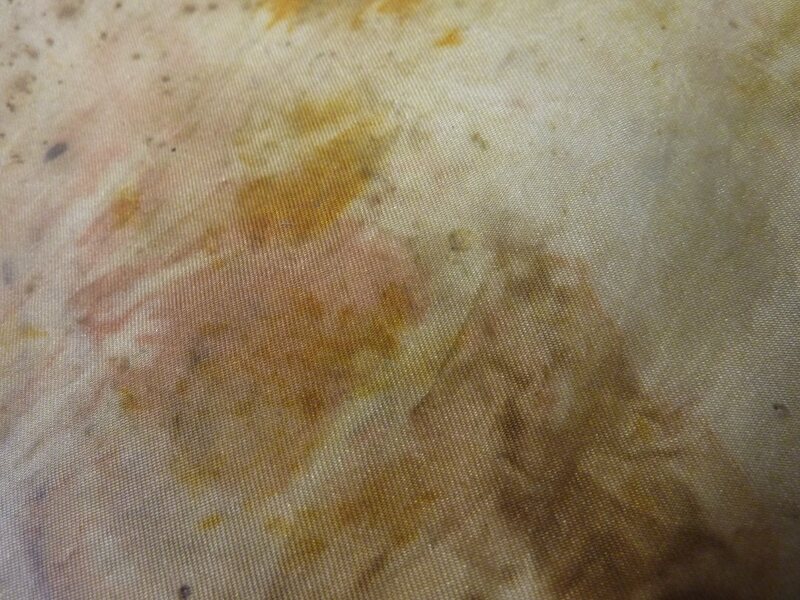 Detail: Eco bundled tagetes mari (deep orange) and purple sandcherry (blue) on vintage linen-cotton mix. 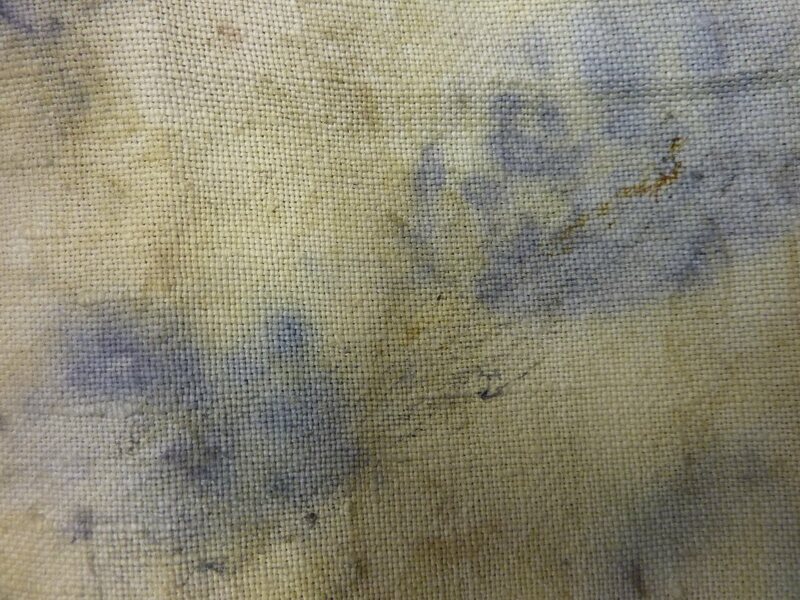 Notes: This vintage linen is well scoured and conditioned for dyeing by its history of much use! 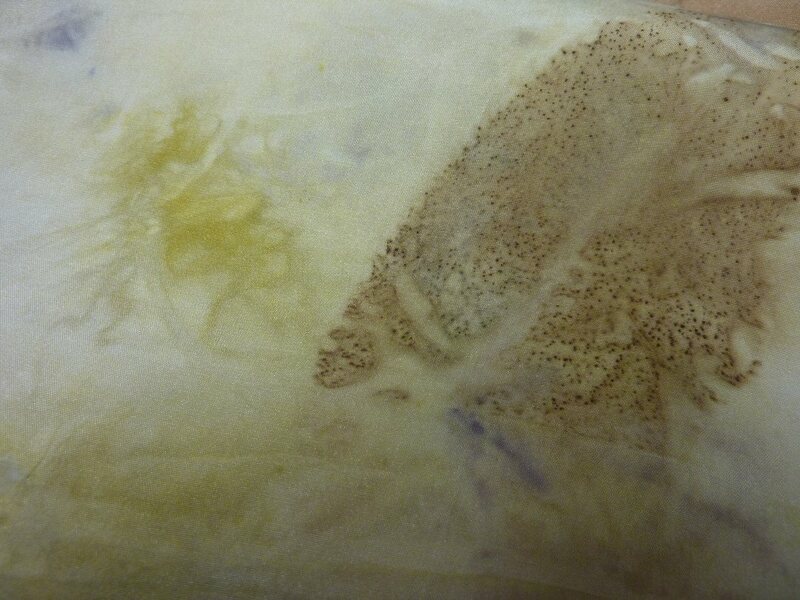 I soaked it in alum and tannin (from sumac leaves) for good measure. 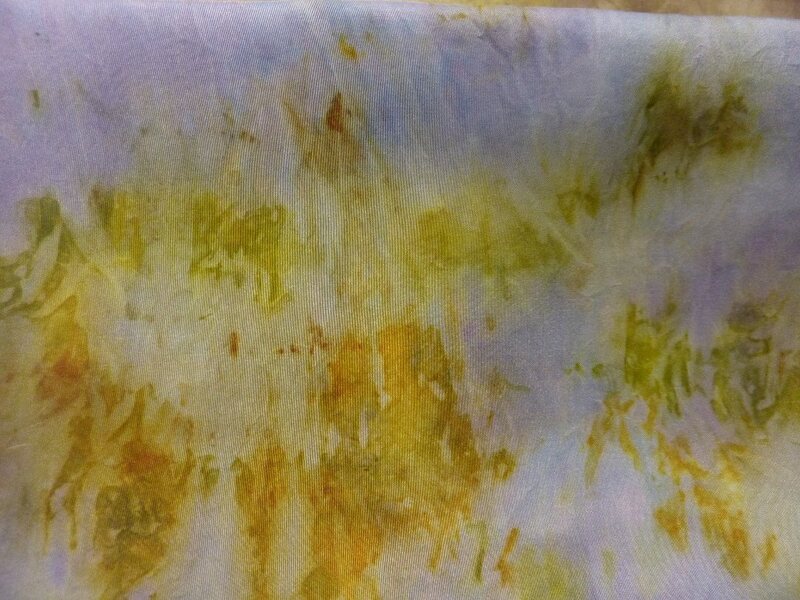 Vintage linens take natural dyes better than newer linens because they are well scoured. 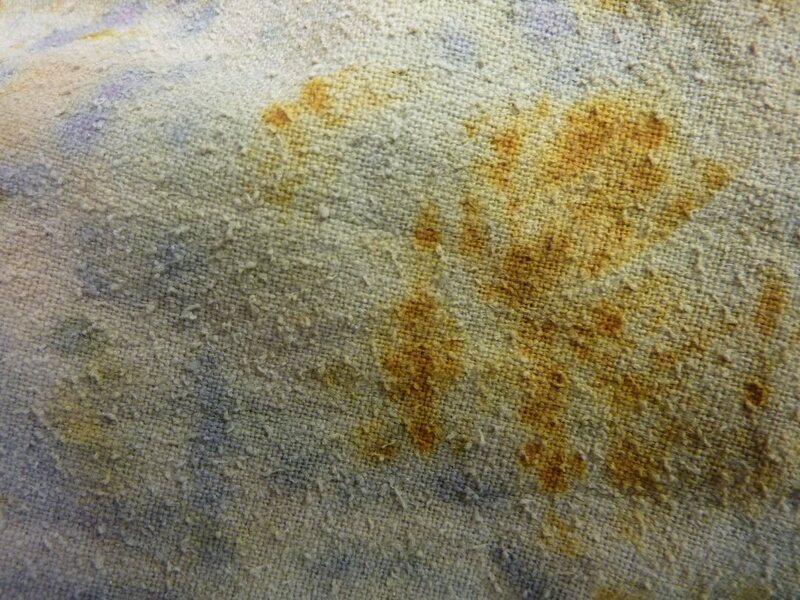 Linen’s reputation for being hard to dye is perhaps more applicable to linens not previously laundered or prepared for dyeing. 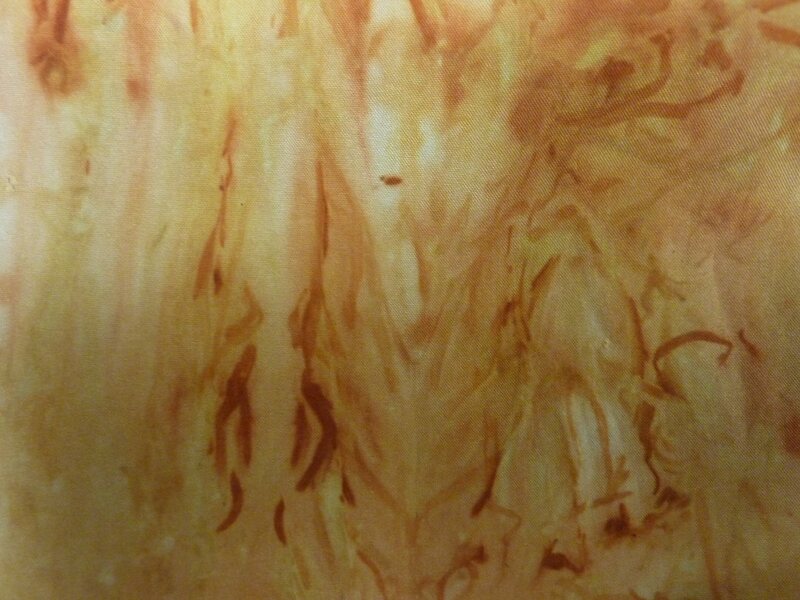 Vintage linens with a unknown laundry history will dye in unexpected ways: that is their allure! 11. 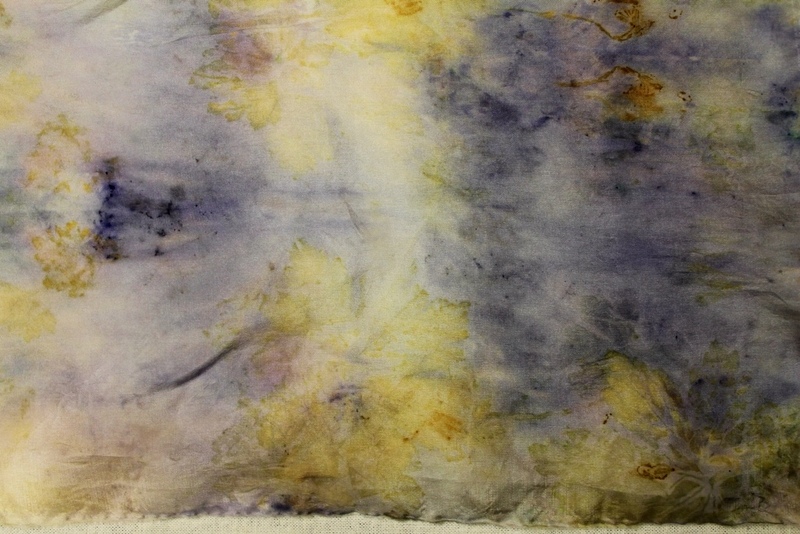 This (well scoured, new) silk noil panel was eco bundled with tagetes mari (orange) and purple basil (blue-violet). 12. 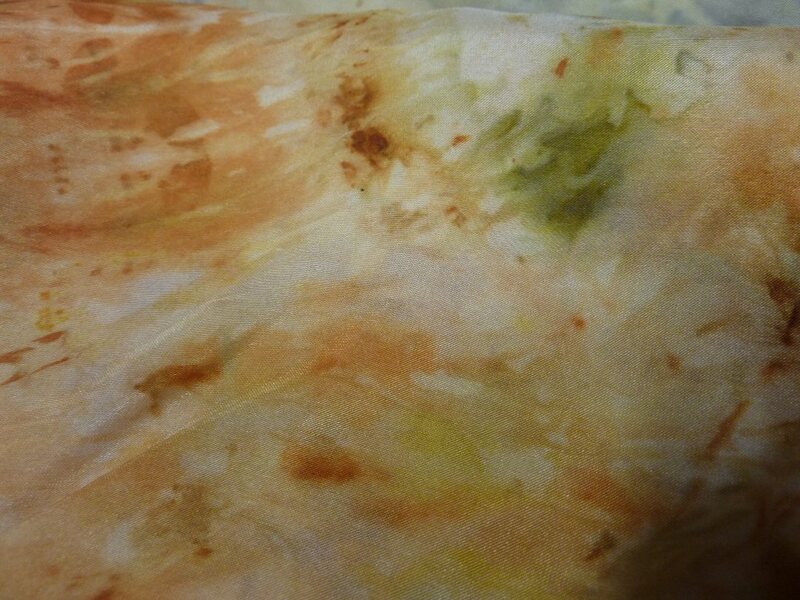 Detail: Tagetes mari (orange-yellow), dried rose petals (grey-brown mottling); rose leaf (green) eco bundled in vintage handwoven refectory linen (from a monastery). 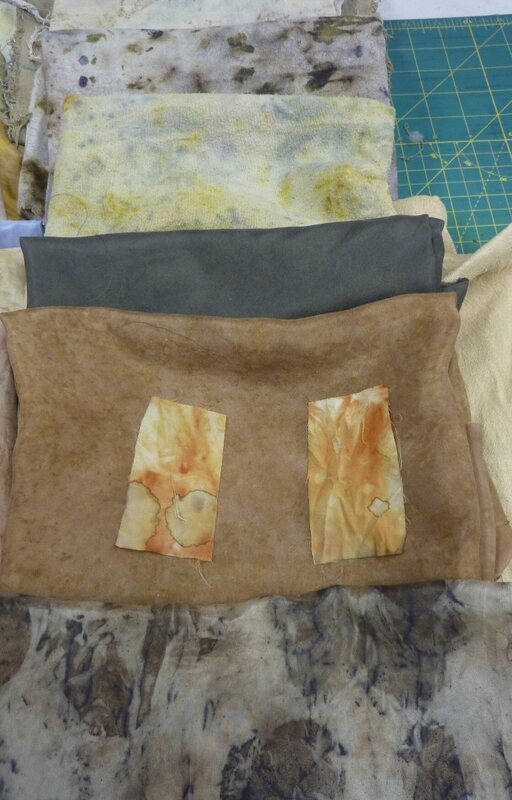 The start of some handstitching – more of that after the garden season is over in Zone 4, Ottawa, Ontario! 13. 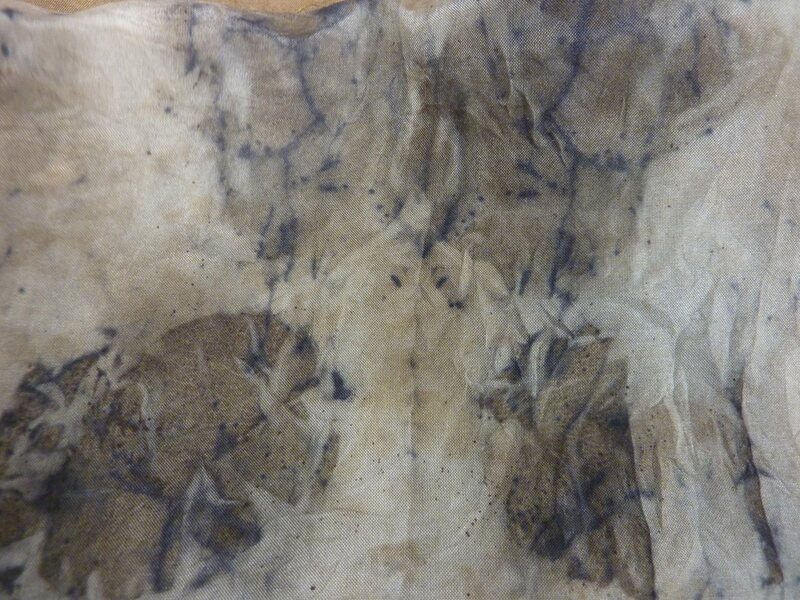 Detail: Lost my notes on this textile! 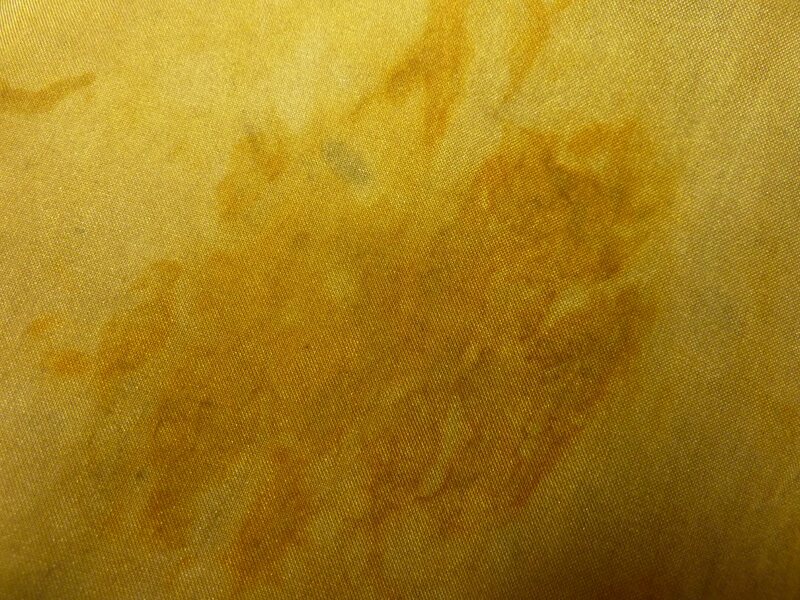 But the greys are likely the result of an iron modifier on a yellow dye – from lichen, maybe, or even from one of the fruit tree (prunus) barks I tried in the early summer. Sometimes I get too excited to and forget to write stuff down. 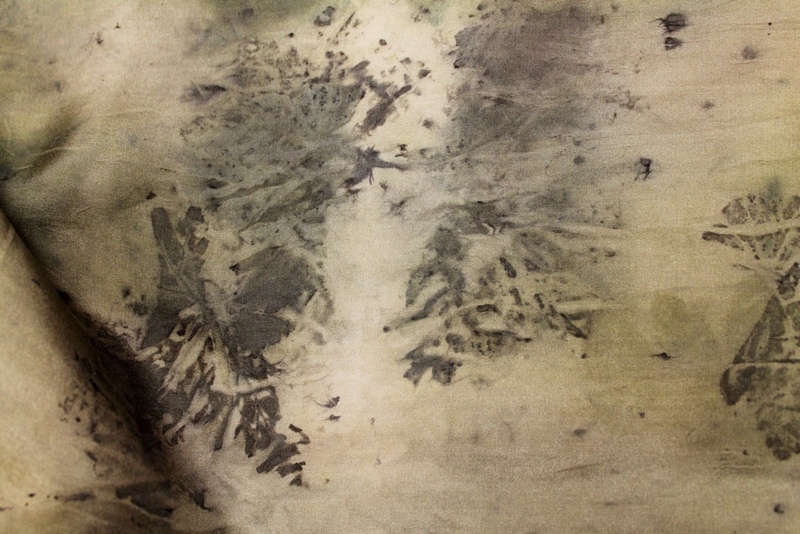 A lovely print, I think, though. 14. 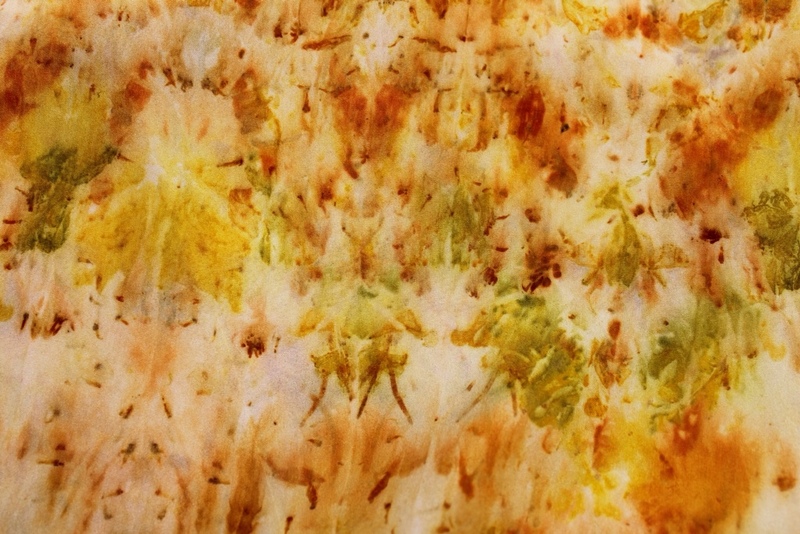 Detail: Silk eco bundled with pear leaf (some leaves turned red early) , tagetes mari and purple sandcherry leaf: Brown-green, yellow-orange and blue-violet prints, respectively. 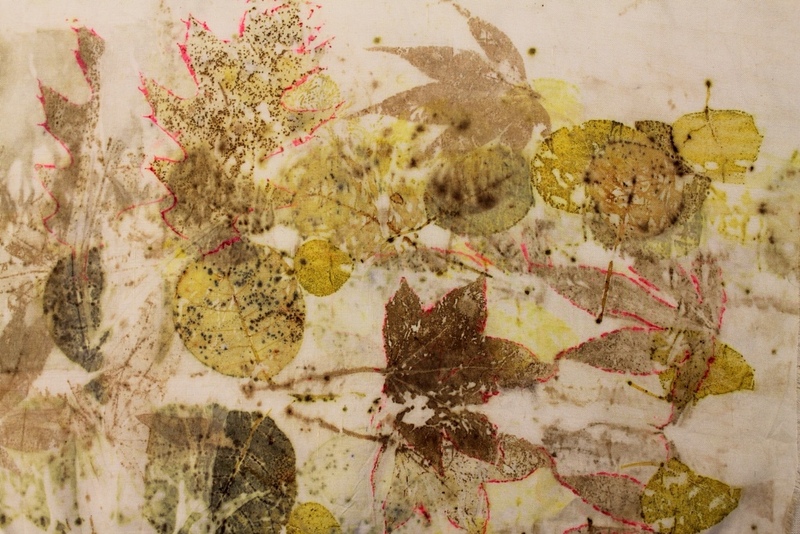 I like the dotty-mottles on the pear leaf contact print. 15. 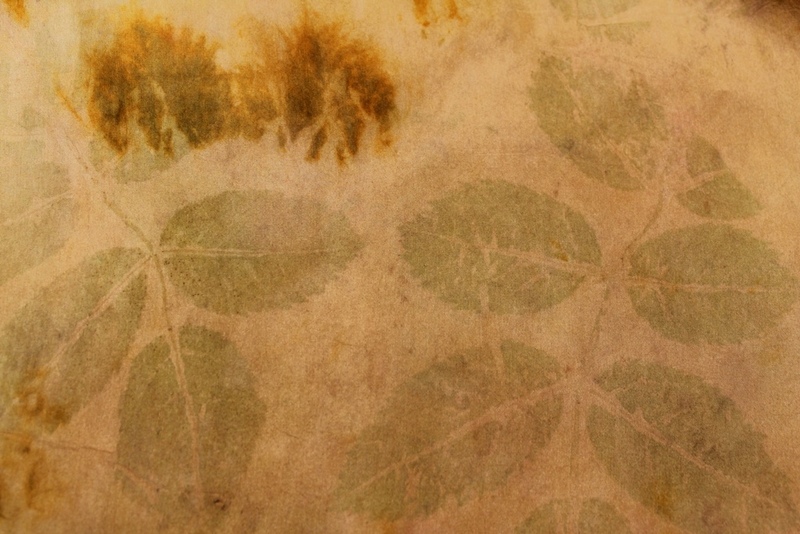 Detail: Mixed eucalyptus leaves (from the florist – this is one plant I did not grow myself!) with tagetes marigold, giving shades of yellow then modified with iron to give shades of browns, greys and blue-greys . This is one of my favourites! 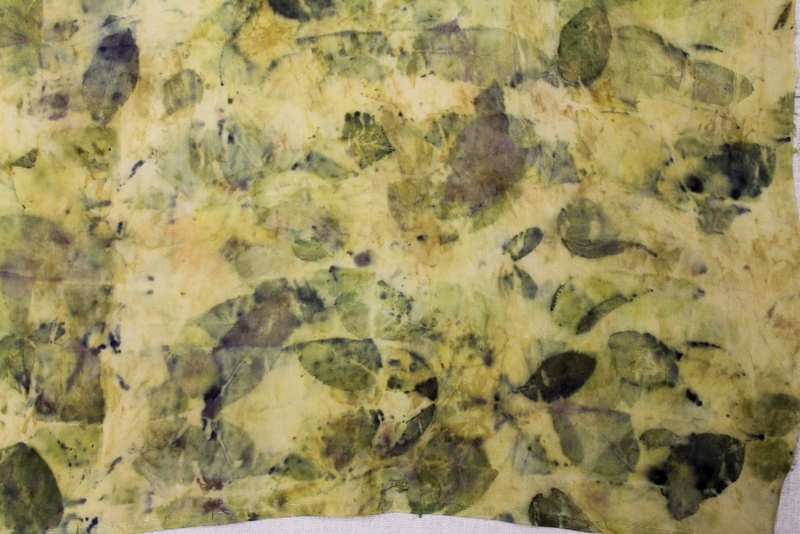 Thank you, India Flint, for sharing your knowledge about eucalyptus dyes – and everything else. India’s work (see link in my Blogroll at left) inspired my 2011 summer’s work. 16. 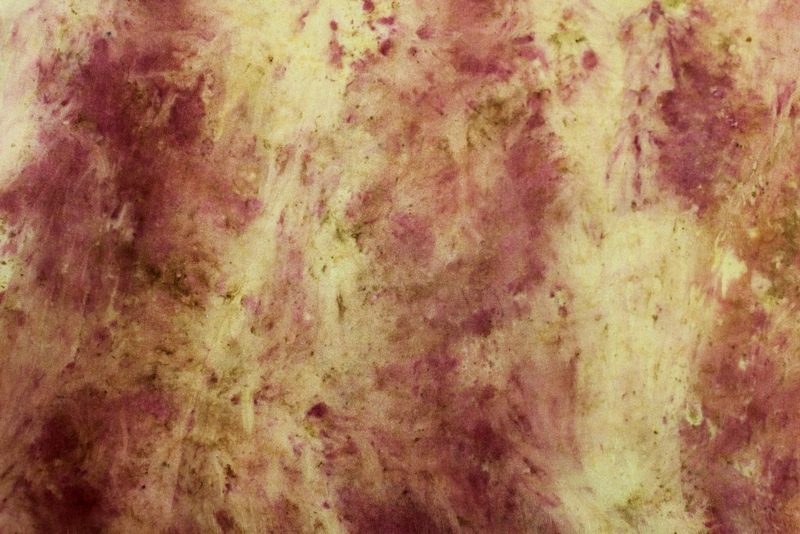 Detail: An eye-popping combo from red sumac berries (pinks and reds) on BlackEyed Susan eco print and dye (greens), in a lumpy eco bundle with silk habotai (8mm). The tiny red berries print little dots and circles and blobs.